The problem is, Drake is a dragon, and he's in love with his very human friend, Violet who gave him a kiss on the snout. And a dragon in love can be a dangerous thing. In fact, Drake is a little out of control. He can't control his fire breathing -- there are flames and sparks flying everywhere, rather like a volcano rumbling to life. Poor Drake decides that although he enjoyed Violet's kiss, he can't let his feelings cause havoc by setting fire to buildings around him, so he must avoid her. He struggles to control his feelings, until his dad explains that fire breathing is a dragon's way of showing their love. Dragons In Love explores Drake's journey as he comes to terms with his feelings and how to share them with Violet. Created by the French author and illustrator duo of Alexandre Lacroix and Ronan Badel, this is a sweet book with a serious message. The illustrations are cute and creative, and the story is simple, yet hopeful and heartwarming. 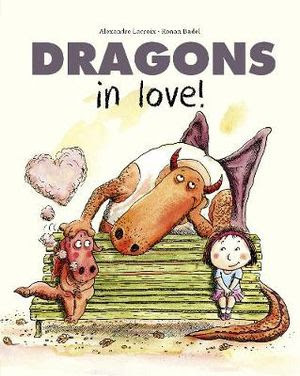 Dragons In Love makes a charming prompt for discussing love and other emotions with children. Also available in the same series is Dragons: Father & Son.